The GAUSS dfgls unit root test procedure follows the methodology proposed by Elliot, Rothenberg and Stock (1996). The testing parameter is given for the case including a time trend and for the case including only a constant. Tests the null hypothesis of stationarity against the unit root alternative, expanding unit root analysis. This addition to GAUSS’s unit root testing capabilities is useful as a stand-alone test or as a complementary tool with other unit root tests for confirmatory analysis. Calculates the KPSS Lagrange Multiplier score statistic and a vector of critical values. Adaptable to model all deterministic components and data frequencies. 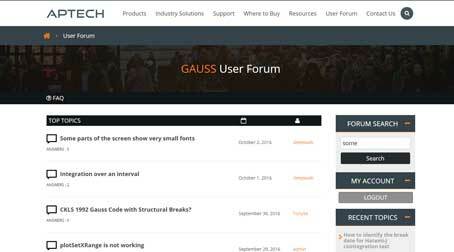 The latest GAUSS TSMT update broadens GAUSS’s unit root testing applications to include cross sectional data. Three new panel series unit root testing procedures provide flexible unit root testing capabilities across a variety of cross-sectional applications. The Breitung z statistic tests the null hypothesis that all series contain a unit root against the alternative that all series are stationary. It assumes that the autoregressive parameter is constant across all panels. In addition, the GAUSS implementation of the Breitung test assumes uncorrelated error terms across panels. The Breitung test builds on the LLC or IPS procedures, with the inclusion of a preliminary pre-adjustment to data prior to ADF testing to address biased estimation. Allows users to specify panel specific lags for ADF regressions. The IPS test is less restrictive than the LLC test, as it tests the null hypothesis that all series contain a unit root against the alternative that at least one series is stationary. In addition, the IPS panel root test allows for heterogeneous autoregressive behavior across panels. The LLC is the most restrictive of the panel series unit root tests and assumes a homogenous autoregressive parameter and independently distributed error terms across all series. Zivot-Andrews The Zivot and Andrews unit root testing procedure widens GAUSS’s unit root testing abilities to cover series with a single, innovative structural breaks in the intercept, trend, or both. The procedure tests the null hypothesis that the series contains a unit root and no structural break. The Zivot-Andrews test requires no knowledge of the break location, but rather estimates the time of the break. A model with asymmetrical effects of the conditional variance proposed by Glosten, Jagannathan and Runkle (1993). The IGARCH(p,q) model is a GARCH(p,q) model with a unit root. For the GARCHM, or GARCH-­in-­mean, model the time series equation is modified to include the square root of the conditional variance. The GAUSS getlrv procedure estimates the heteroscedasticity and autocorrelation covariance (HAC) of time series data based on a user specified kernel and bandwidth length. This new GAUSS feature provides a useful tool for a variety of time series modeling and estimation needs. Kernel options include the Parzen, Bartlett, and Quadratic Spectral density. The adjrsq procedure providers a user level tool to find the adjusted R-Squared statistic following the estimation of a linear regression model. It requires both the original data and the residuals from the estimate as inputs.